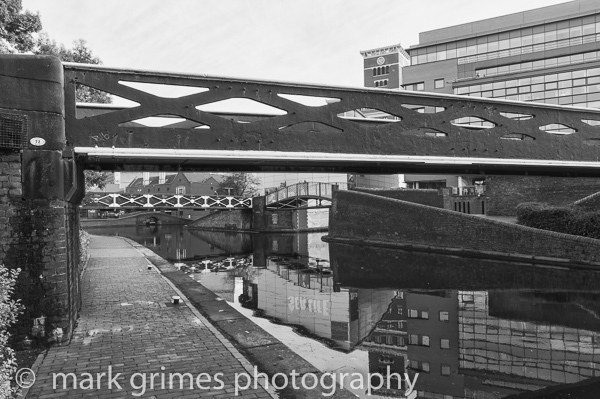 Birmingham boasts not just many miles of canals but many types of bridge. Pictured here are four old and new bridges looking towards Farmers bridge on the Birmingham Main Line. The bridge on the right crosses the Oozell Street Loop which was part of the original Birmingham Main Line surveyed by James Brindley. I see this photo has caused quite a stir between some of the contributors. All I can say is, chill out! It’s just a photo. That’s all, nothing more. I agree with some of the sentiments already posted but not all. There is an immediacy to the piece that somehow makes it live, as if the concrete and metals were vibrating with life. A technical tour de force. The viewer is almost forced to focus on the immediacy of the striking foreground bridge, whilst the background scenery settles gently into place. There is a certain optical effect here, limiting the field of vision to maximise visual impact. I think this picture is ideally suited to the black and white format and the definition and visual progression is spot on. I would hardly decribe this as ‘a technical tour de force’ myself but I agree with your summation of the work as exerting a certain force upon the viewer whereby he is almost forced to focus on the foreground subject, i.e. the bridge, while the objects composing the background settle quite naturally and unobtrusively forming a pleasant contrast to the beholder that is so often the hallmark of an emotionally charged piece such as this. Personally I don’t think the technical excellence of this picture can be questioned. You yourself have acknowledged the optical effect the landscape has on the viewer…this doesn’t come about by chance! It takes a trained eye and hard won experience to produce images like these and I feel the reviewer is thoroughly justified in highlighting the technical proficiency behind such photography. And it’s not a one off. As can be seen across the range of images on this site, the photographer is a skilled operator who really knows how to get the best out of his environment. I can accept that a particular phrase in a review might be a little off-putting, but I think we can both agree that this is quite a powerful image. In no wise, Sir, was I calling into question this picture’s technical brilliance. Neither do I need to be reminded of what I myself wrote regarding this artistic portrayal of industrial Britain. My objection relates entirely to attributing to this piece, while undeniably excellent, the expression: ‘technical tour de force.’ To earn that specific title the piece requires just a little refinement in my humble opinion. I will not be forced to back down on this issue. That said, I do indeed acknowledge that this is, as I said previously, an emotionally charged piece about which the chronicler/photographer can be justifiably proud. I confess to being more than a little perplexed by your reply. You admit the technical brilliance of the photo and yet you have the temerity to challenge my ‘technical tour de force’ expression! This is surely a case of silly nitpicking: we’re both saying the same thing! Although the term is overused, i am happy to go further than my original term and say that this picture is just on the edge of genius, such is the technical mastery and overall impact. Clearly we are both great admirers of this particular composition and I shall end my post on that positive note. It’s nice to see someone with a background interest in their subject matter; it really shows in your work. There’s a real intensity to this shot and a real mastery shown in the use of horizontal lines. The foreground bridge is very prominent, but not too domineering … it draws the eye in to the gentler background patterns and shadows provided by the other bridges. Lovely contrast. Whilst it might be thought of as a ‘busy’ image, I’d say the camera position is ideal. It shows all the bridges in a flattering light, and is ideally suited to the black and white format. The crisp, clear lines also reveal a trained operator with a solid technical understanding; you clearly know how to get the best from your environment. If I had to identify a style, I’d put it in the Andrew Prokes mould. I expect we’ll be seeing a lot more of your photography in the future and I’ll certainly be recommending your site to my photography friends.